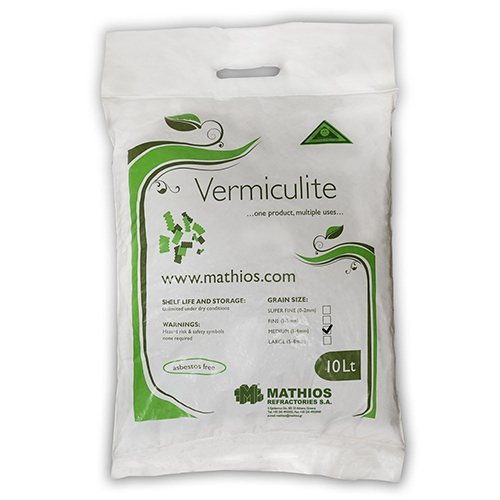 Exfoliated Vermiculite for Gardening | Mathios Refratctories S.A.
Keep your plants hydrated & aerated! Soil aeration, nutrition and water are definitely the three things that make your plants blossom. Yet, Even if you find that the soil is not lacking in any or all of these domes, there’s something that you can add to improve the soil structure and help your plants thrive: Vermiculite. Vermiculite is a hydrous phyllosilicate mineral and undergoes significant expansion when heated. It is very lightweight and mixes easily with other mediums. Exfoliated Vermiculite’s unique properties make it highly recommended in the horticulture. – It increases aeration and moisture retention, saving 30-50% water. – Through its high Cation- Exchange Capacity (CEC), Vermiculite minimizes fertilizer leaching. – It is an excellent carrier and extender for fertilizer and pesticides and works well as packing material for bulbs and tubers. – Vermiculite helps plant growing faster and it is ideal for transplanting, flowers arranging, newly seeded lawns and roots cutting. – Exfoliated Vermiculite by Mathios Refractories is Asbestos free, non-toxic and environmentally safe. – Due to its handy sack, Mathios Refractories’ Vermiculite is easy and safe to grip, lightweight and simple to use. – It has unlimited shelf life under dry conditions, so no storage worries. – Now available in 10lt and 100lt bags. Contact Us to find out more and see your plants thriving like never before.